All I ever saw my dad do was race, so when I was five, he got me a Barbie corvette and took out the batteries and put two car batteries in it to make it go faster. That was the initial thing that made me think this is what I wanted to do. 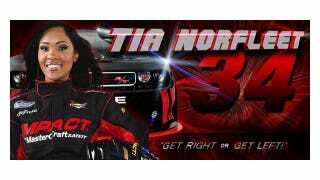 It remains to be seen whether or not she will qualify for any of the big races (in her debut at the Motor Mile Speedway, she placed 23 out of 25), but Norfleet admits she is fast both on and off the track: "I don't want to incriminate myself, but I speed anyway. But I don't have a lot of speeding tickets."